Monday, May 20, 2019: 7:30-9:00. Program: Chris Fonvielle returns to talk about the Battles of Sugar Loaf, which took place on January 19 and February 11, 1865. The Union’s repeated defeat forced them to move troops across the river and approach Wilmington from the west. The History Center recorded 85 visitors in March. There were 30 people in attendance at the March meeting. The History Center was used by the Got-Em-On Live Bait Club, the United Daughters of the Confederacy (UDC) and Walk of Fame Committee. Welcome to member, Christine Carrington of Wilmington and Lauren Gibbs of Wilmington. Thanks to Darlene Bright for helping with the Newsletter. Thank you goes to Jay Winner for fixing the “trip and fall” at the end of the handicapped ramp. Thanks to Darlene and her daughter, Cindy, who did a bang up job of DEEP cleaning the History Center. Thanks to Leslie Bright for painting the roadside sign and making new letters for the missing ones and painting them black. Thanks to Leslie and Darlene Bright and Jay Winner and Rodney Jones for cleaning the exhibits and giving them their spring spruce-up. Thanks to all who helped with the Anniversary Celebration! Darlene Bright, Linda Ogden, Cheri McNeill, Steve Arthur for the refreshments. A huge thank you goes out to Ray and Pam Bramhall for donating the cost of the Anniversary Cake. Thanks, too, to the Board members for donations toward the decorations; Jim Dugan, Leslie Bright, Jimmy Bartley, Barry Nelder, John Moseley, Steve Arthur, Juanita Winner. 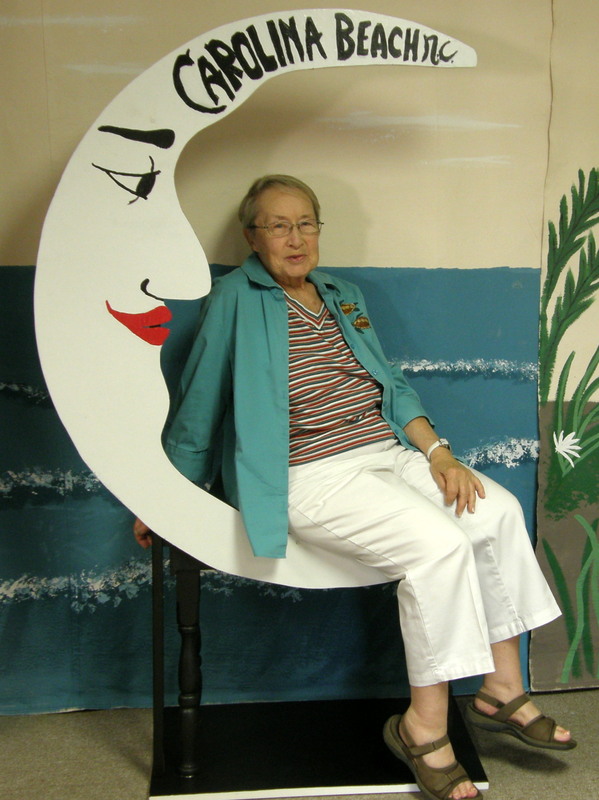 Editor’s Privilege: Longtime member, Lois Taylor, passed away on Monday February 18 at the Brunswick Care Center of Lower Cape Fear Hospice. Lois joined FPHPS in 2000 soon after she moved to Kure Beach. She served as Secretary of the Society for many years and she is the reason Rebecca works here now. Lois’s father was a U.S. History and Civics teacher in the Youngstown, OH schools for almost 40 years and she was a keen observer of politics at the state and national level. When traveling, every time they passed a historical marker she demanded they screech to a halt, pull over, and read it. Her love of history led her to attend every historical lecture, program, and event that took place in our area and she was a charter member of the Chris Fonvielle Fan Club! Lois spent 25 years as office manager for her husband’s CPA firm and worked as a freight pilot for International Harvester in the 1980s and 1990s. She was very active in the Ohio Chapter of the Ninety-Nines, an international club of women pilots. After she retired to Kure Beach, her interests included turtle tracking at the Fort Fisher State Recreation Area, and playing bridge. At various times she belonged to five book clubs. She also traveled with numerous Road Scholar groups, and managed to visit every continent except Antarctica. Her greatest joy was indulging her 2 daughters, 2 granddaughters, and 1 great granddaughter. The History Center recorded 53 visitors in February. There were 50 people in attendance at the February meeting. The History Center was used by the Got-Em-On Live Bait Club, the United Daughters of the Confederacy (UDC) and Step Up For Soldiers. Welcome to member, Brian and Whitney Tribble of Wilmington and Jeanette Koshar of Carolina Beach. Thanks to Jim Kohler for helping with the Newsletter, Steve Arthur for removing our “swimming pool,” and general moral support. Thanks to Cheri McNeill and Steve Arthur for the February refreshments. Monday, April 15, 2019: 7:30-9:00 pm. Program: Richard Jones, who is licensed by the North Carolina Department of Agriculture to grow Venus Flytraps, will talk about the history and biology of our most famous native plant. The Society membership extends their heartfelt sympathy to the family of long-time member Paul Slebodnik who passed away on January 4, 2019. He was a valued member, a volunteer for all events and a special friend to those who knew him. The History Center recorded 53 visitors in November. There were 49 people in attendance at the Christmas Potluck. The History Center was used by the Got-Em-On Live Bait Fishing Club, and the United Daughters of the Confederacy (UDC). Welcome to new members, Lynn Williams of Wilmington, Steve and Kim Baumann of Wilmington, Matt Pugliese and Beth Ann Burns of Kure Beach, and Joseph and Terry Benson of Carolina Beach. John Gregory converted his membership to LIFETIME. Thanks to our volunteers this month: Steve Arthur for his tour of the Boardwalk, decorating for Christmas & taking it down, helping with the Potluck. Jim Kohler who helped with the Newsletter. Cheri McNeill Steve Arthur and Darlene Bright for all the work they did getting ready and cleaning up for the Christmas Potluck. Eddie Capel and Darlene Bright for doing our bookkeeping. Leslie Bright for getting ready for the Christmas Potluck, and upkeep of the building. Also, Elaine Henson, Rebecca Taylor, Eddie Capel and Cheri McNeill met with Mayor Joe Benson to fill him in on the history of our Society. Thanks to Steve Arthur for doing our Boardwalk tour for a group of local Island Women! The History Center recorded 80 visitors in November. There were 36 people in attendance at the November meeting. The History Center was used by the Got-Em-On Live Bait Fishing Club, Step Up for Soldiers, and the United Daughters of the Confederacy (UDC). Welcome to new member, Roger Brix from Wilmington. 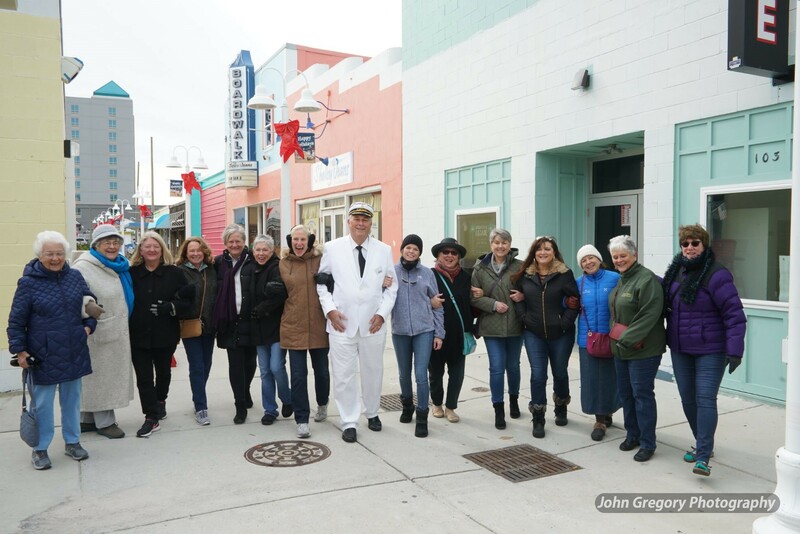 Thanks to John Gregory for taking great pictures of the walking tour for the Island Women. Thanks to our volunteers in November; James Kohler, Andre Blouin, Steve Arthur, Darlene Bright and Leslie Bright. Refreshments were provided by Steve Arthur and Cheri McNeill. Nancy Gadzuk has graciously agreed to take minutes at the meetings until we find a Secretary. Rebecca, Cheri and Darlene greatly appreciate Andre Blouin’s help getting the November newsletter laid up and posted on our web site!!! Thanks so much to Juanita Winner’s grandson, Skylar Slaughter, who volunteered for us this month. He helped decorate the History Center for Christmas. Also, he washed the windows and help neaten everything up. 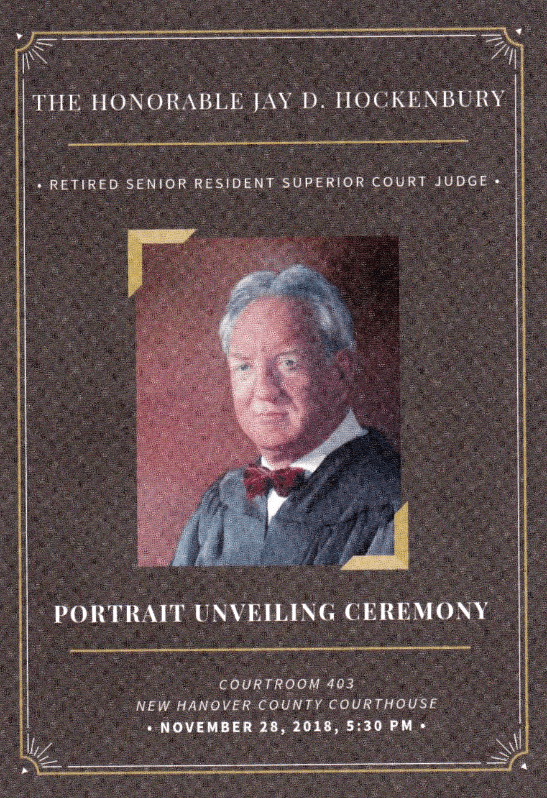 Congratulations to Judge Jay Hockenbury on his retirement from the bench after almost 24 years of distinguished service. The History Center recorded 62 visitors in October. There were 37 people in attendance at the October meeting. The History Center was used by the Got-Em-On Live Bait Fishing Club and the United Daughters of the Confederacy (UDC). Please keep Rebecca Taylor in your thoughts and prayers. She fell right after our September meeting and broke her leg. She is recovering nicely at New Hanover Regional Medical Center. She will be staying in the hospital, but in the rehab part of the hospital. 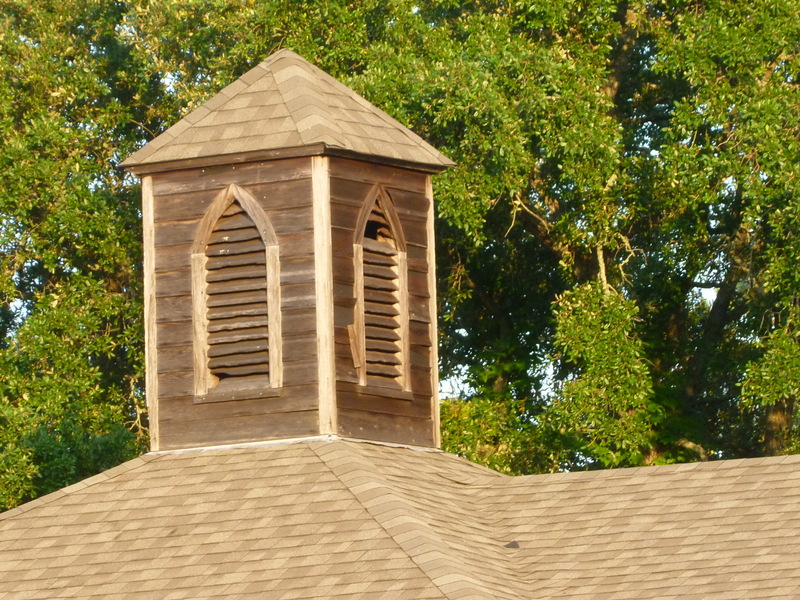 A great big thanks goes out to Steve Arthur and Pam and Eddie Capel for providing refreshments at the October meeting. 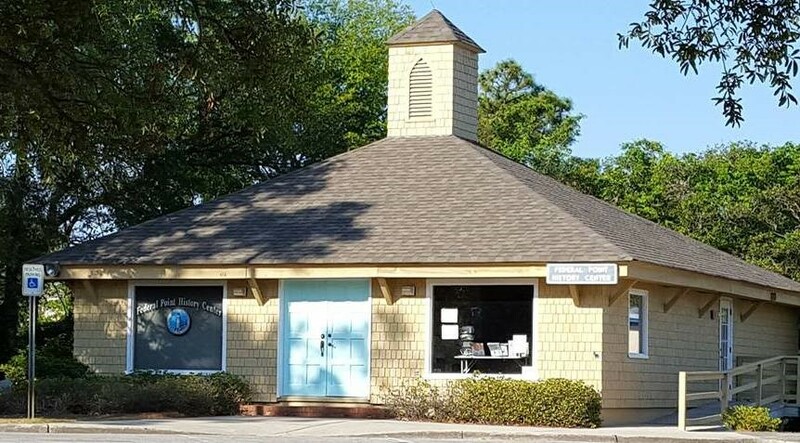 The Friends of Fort Fisher are sponsoring Fort Fisher’s Christmas Open House on December 1, 2018, from 10:00 AM till 4 PM. Cookies will be provided by the UDC. Welcome to new members, Paul D. Buehler and Elaine G. Farias, Polly Burtelow and Victoria J. F. Palmer, all of Carolina Beach. By special request, Steve Arthur will be doing a Historic Boardwalk Tour for the Island Women on November 27 at 10:00 AM. Thanks to our volunteers in October, James Kohler, Steve Arthur, Darlene Bright and Leslie Bright. Christmas season is upon us! When making out your Christmas list, think of all the really good books, especially our Cookbook, and other nice gifts in the History Center Gift Shop to give to friends and family members. The Walk includes the entrenchments in the proposed “Ryder Lewis Park”. Center recorded 23 visitors in September. We were closed for 6 days due to Hurricane Florence. Our September meeting was within that time and was canceled. The History Center was used by the Got-Em-On Live Bait Fishing Club. Thanks to the people who helped get the History Center ready before the storm: Rebecca and Cheri, Darlene and Leslie, Steve Arthur and Jim Dugan. Cheri, Leslie and Darlene put everything back out after the storm. Rebecca put the computers back together. WOW! Our first season is over and there’s no question our Historic Boardwalk tour was a great success. WE HAD 144 PEOPLE ATTEND 7 TOURS (one got rained out) and collected $520 in donations! We want to extend a HUGE thanks to Elaine Henson for doing the research and writing the script and finding all the “what used to be here” photos! She bought the tote bags that the tour leaders used, as well. Thanks, also, to Rebecca and Cheri who put together the tour tote scripts and pictures. Special thanks go to Erin Whitman from Carolina Beach Parks and Recreation for designing the rack card that got the word out to the tourists. A huge thanks to Jasmine McKee and the Island Gazette for including an article about the tour in every paper throughout the summer. We asked people where they heard about the tour and the most people told us they found out about it in the Island Gazette. The Star-News sent reporter Eva Ellenberg and photogrpaher Matt Born to cover the tour. 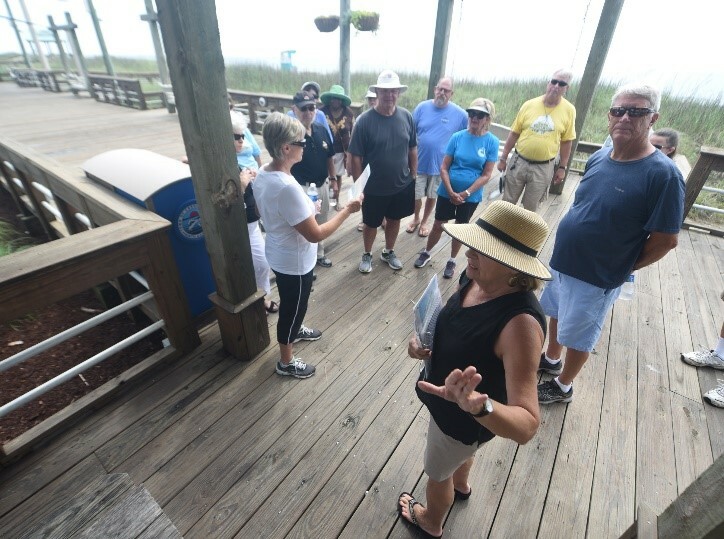 You can see their article and pictures at http://www.starnewsonline.com/news/20180627/carolina-beach-boardwalk-tours-explore-its-early-glory-days And finally, thanks to Randy Aldridge from WWAY who did a great interview with Elaine. We couldn’t have done it all without our volunteer tour guides! Elaine Henson, Leslie Bright, Darlene Bright, Jim Dugan, Doris Bame, Byron Moore, Judy Moore and Steve Arthur. No question, we’ll do it again next year from mid June to mid August! The History Center recorded 103 visitors in July. We had 45 at the July Meeting. 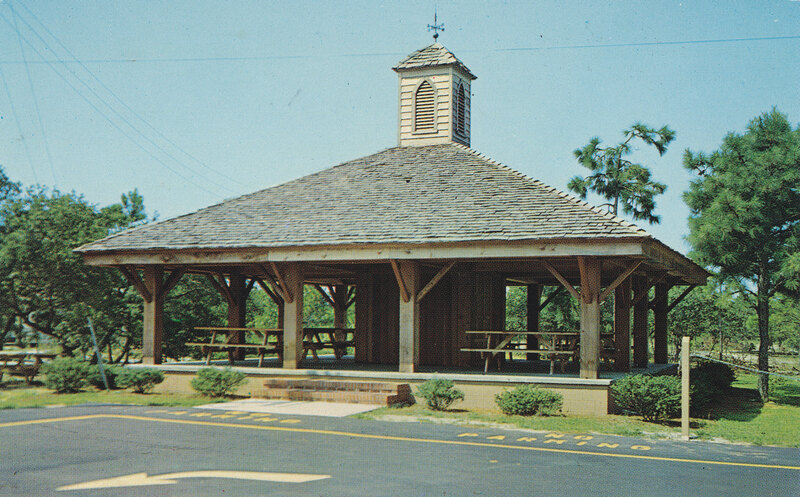 The History Center was used for meetings held by the Got-Em-On Live Bait Fishing Club and the UDC Board. Darlene and Eddie Capel have spent a good deal of time preparing the budget for 2018-2019 which was approved at the August 6 board meeting. Mix the vinegar, onions, brown sugar, salt and pepper in a pot and bring to a boil. Add drained canned green beans. Heat thoroughly, stirring to mix, and let stand 2-3 hours. Heat before serving and add crumbled bacon. Welcome to new members Kathy Gwinn of Carolina Beach and Melinda and Glenn Miller of Carolina Beach. The History Center recorded 96 visitors in June. We had 25 at the June Potluck. Darlene is in the process of training our new treasurer, Eddie Capel and preparing a budget for 2018-2019.